I have always wanted to write a book. The vision in my mind of writing a book was the heavy work of typing up, editing and reworking a manuscript. I pictured rejection letters and rewrites. But eventually someone would be inspired by the heart and realize that others need the opportunity to be inspired as well. The book would go to print and have a really cool cover designed by an awesome graphics person. I could see my book on the shelf at Christian book stores and one of my favorite retailers in the world, Barnes and Noble. Yes, I am human and I struggle so much with the desires of my selfish flesh. Part of my wanting to write a book is to live out my mission to encourage with love, passion and enthusiasm. What a great way to send encouragement out to the masses. I wanted to be apart of uplifting people all over at different times and places just as the great authors of the books I love have done for me. But God, in all His mysterious goodness, I believe has another plan. At least for now. I enjoy writing cards of encouragement and prayer to people. I love putting little surprises in the mailbox for people. Many months ago I had an inspired idea. What if I wrote a book specifically to one person? What if it was a compilation of notes and prayers and thoughts specifically for one person? An extended card if you will. How amazing would it be to write someone a personal book?!! What kind of encouragement could come from giving someone a book that was written just for them? What would you do if you received a book written especially for you? How would that make you feel? I felt as though I was prompted for reason. I wanted to be obedient and just do what I was asked, leaving the outcome in God’s hands. 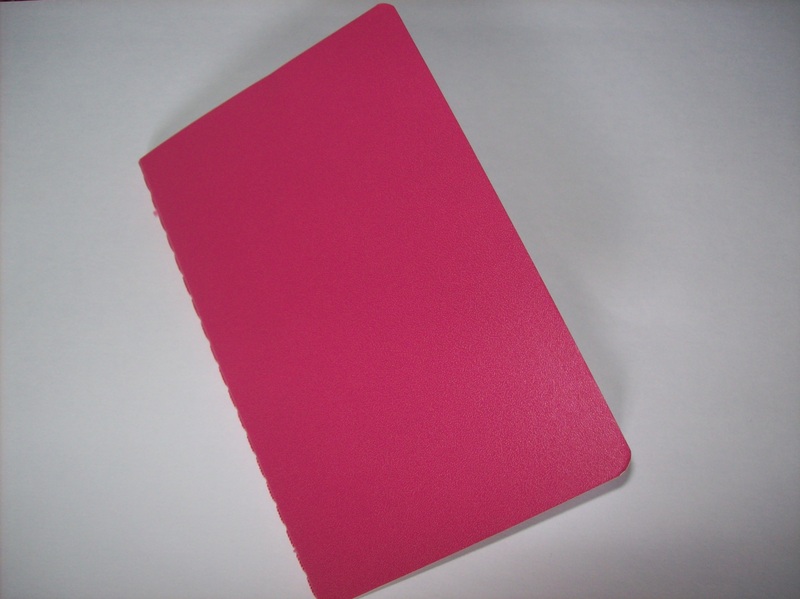 This is a picture of a little pink notebook. It is five and a half inches high; three and a half inches wide. If you count front and backs it is 60 pages long. There’s no cool graphic. My name is not in bold print on the front. It is little, simple and would easily be overlooked if it was sitting on the shelf at Barnes and Noble. This is what my first book looks like. So does my second. Writing these books has been a slow and ongoing process. I prayed a lot about who to write the first one to. God, as He always is, faithfully provided and filled the pages with material. It was a while before I started the second. The second took me much longer to write. In fact I just put it in the mail the other day. I am positive that it has not been received yet. I have no idea what will come of it. I do not know if it will bring its recipient joy or if it will uplift them. Perhaps it will be read once and recycled being basically forgotten about. Maybe it will be held years and re-read so often that it begins to fall apart. Either way, that is not up to me. So why am I sharing this? God’s ways are not our ways. It is my hope that if I share my experiences, you will be encouraged to use your gifts in whatever way God asks you to. I pray that if you walk in the path God has for you that you will find a joy that refreshes the depths of your soul. The work that God has for us, is so very rarely like what we picture. It may not be what we envision. But, what I have found is that it is often so much sweeter than anything we can imagine. God’s way has also taught me so many lessons – about myself, my expectations, about who He is and about the relationship that we share. Even though I really would like more information now, I want to know what is going to happen in the future. The truth is that I am not ready for it. It would not mean the same if God told me now. Honestly, I could not handle that and in my humanness, I would try to manipulate it and control it. God asks us to trust Him and to praise Him. Regardless of circumstances and situations, trust Him and praise Him. All too often I am guilty of thinking that I am falling short in my efforts to achieve my mission. I am quick to judge and to look at short term results. My life will be such a brief period on this side of Heaven, yet I am a part of an eternal story. You are a part of an eternal story. I bet that God is using your gifts in incredible ways each and every day. You may not even know that it is happening. Your life is interacting and intersecting with other lives. Your thread of life is being weaved with other threads of life and with God’s golden thread of grace. The result is that you are important to the great tapestry of eternity. It is made more beautiful because you are who you are. When you are questioning whether you are living out your purpose or not, when you are second guessing yourself, remember that God works in mysterious ways. Take hope in what you are putting into your days and leave the outcome to God. Thank You so much for being our God. Thank you for creating us with purpose and potential to be a part of Your everlasting eternal story. Lord, please help us to focus on what we put into our days and not on what we get out of them. Please help us to focus on You, on praising You and on bringing You glory. May we be willing to do that which you are asking us to do, with the best obedience that we can muster. This prayer is much easier to say than it is to do. Please help us to live it out. In the amazing name of Jesus, amen. Julie, I absolutely love the paragraph about threads woven together with grace for the tapestry of eternity. It is going into my book of quotes to remember 🙂 Thanks for writing this “book” for all of us to enjoy and learn from. You are inspiring masses, sister friend! Jana, thank you so very much for the encouragement! What a blessing you are!